Facebook is replete with requests for love and support in the holiday season. The more celebrations gear up, the more anxiety rises. The brighter the celebration glows, the gloomier the sense of loss becomes. “I don’t know how I will get through the first year.” “I will be all alone this year.” Similar sentiments pop up as we scroll post after post. Then we look beneath the surface of life stories and realize one principle: struggle strengthens; perseverance promotes growth. Yes, there were (and probably always will be) holidays with emotional stings. There will be a sense of loss, whether human or canine, as empty places remind us of holidays past. There will be a sadness as life in the new normal emerges. But then we start using the pain to encourage another who enters into grief. We use the lessons learned during suffering to comfort another as they step into the process. We come along side one who is experiencing the crush of loss thinking they won’t survive to show them they will make it. 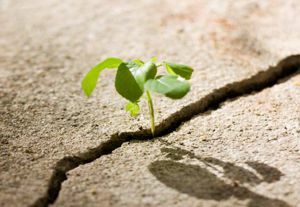 We see the sweet pictures of tiny trees shooting up through solid rock; we see flowers budding through city sidewalks – and know we are reminded to persevere… to break through the suffering and blossom. It isn’t always this poetic, is it? Sometimes the rock seems too hard and the concrete too solid. But God makes a way to trust Him in the darkness. He takes the jack hammer of grace and turns the rock of pain into the Rock of our salvation. Those who never exercise their faith muscles end up with flabby abs. Those who seek a life with no trials are often an inch deep, with no ability to relate or connect. So, in this season of dazzling lights, unrealistic expectations, and severe disappointments, let’s use the lumps and bumps to grow fabulous musculature… strong, tested, and true. Pain exists, but maturing into someone useful to others is worth the hurt.